The Crusade of Romanianism (Romanian: Cruciada Românismului, also known as Vulturii Albi, "White Eagles", or Steliștii, "Stelists") was an eclectic far-right movement in Romania, founded in 1934 by Mihai Stelescu. It originated as a dissident faction of the Iron Guard, Romania's main fascist movement, and was virulently critical of Guard leader Corneliu Zelea Codreanu. Stelescu reinterpreted nationalist ideology through the lens of anticapitalism and "humane" antisemitism, appropriating some ideas from communism and Italian fascism. The Crusade was famously associated with Panait Istrati, world-renowned novelist and dissident communist, who added into the mix of "Romanianism" some elements of libertarian socialism. The Stelists oscillated between maverick independence and electoral alliances with more prestigious nationalist parties. The Crusade was a minor party, whose decision of publicly settling scores with the Iron Guard proved fatal. In the summer of 1936, Stelescu was murdered by an Iron Guard death squad, and his party only survived for one more year. Its caretakers during that final period were journalist Alexandru Talex and General Nicolae Rădescu. Originally named "The White Eagles", the Crusade emerged in early 1935, as a splinter group from the Iron Guard. Stelescu's break with Codreanu was sudden and public. In 1932, Stelescu was a prominent Guard politico, tasked with political campaigning in Bucharest and the youngest Romanian Parliament member. As documented by visitors Jean and Jérôme Tharaud, Stelescu eclipsed his political boss in matters of oratory and political competence. As a consequence of this, Codreanu began handing him risky assignments, implicating him in the assassination of Premier Ion G. Duca (for which Stelescu served a term in prison). It is also likely that Stelescu was infuriated by Codreanu's refusal to tackle the political establishment head on: in 1934, the Guard was keeping a low profile, content with mildly criticizing the authoritarian King of Romania, Carol II. When, in September 1934, Stelescu went public with his first denunciations of Codrenist tactics, he was promptly excluded from the Guard. The decision had a vague disclaimer: Stelescu could be welcomed back into the Guard on condition that he perform an exceptional act of self-sacrifice. According to later Codrenist mythology, Stelescu had in fact been exposed as the would-be assassin of Codreanu. For his part, Stelescu alleged that, by hinting at reconciliation, Codreanu had discreetly urged him to poison another one of the Iron Guard's adversaries: Foreign Minister Nicolae Titulescu. Stelescu left together with some other high-ranking activists of Codreanu's movement, who helped him establish the "White Eagles" party, and possibly convinced all of the Guard's youth sections in Bucharest to join them. Historian Franklin L. Ford sees the schism as important, arguing that Stelescu effectively took control of the "Cross Brotherhood" network, which he had helped recruit for the Guard in the late 1920s. Citing the Guard's supposed elitism, Stelescu hoped to rely on support from more populist Guardsmen, including Ion Moța and Gheorghe Clime. Reportedly, the splinter group soon found support among figures of the Carol regime, who financed it as a way of drawing away support from the Guard. On November 22, 1934, Stelescu established his eponymous weekly newspaper, Cruciada Românismului, with Alexandru Talex as editor and himself as director. Talex, who was politically independent, had been university colleagues with Stelescu. He was moved by Stelescu's marginalization, but, as he recalled in a later interview, personally disliked him. Talex and Stelescu were allegedly supplied with funds by Prince Constantin Karadja, who also contributed to the paper. Another important figure was Gheorghe Beza, an Aromanian dissident of the Iron Guard, famous for his earlier involvement in political conspiracies. Other men involved with Stelescu's newspaper, and probably his movement, were journalists Sergiu Lecca, Dem. Bassarabeanu and Mircea Mateescu. Joining them were a cartoonist, Gall, and, occasionally, the aspiring poet Constantin Virgil Gheorghiu. More famously, Cruciada Românismului hosted articles by Panait Istrati. He was a literary celebrity and long-time socialist, whose public denunciation of the Soviet Union had sparked an international controversy. It is still unclear whether Istrati was ever formally affiliated with the Crusade as a political party. Some authors suggest as much. In April Istrati died from tuberculosis in Bucharest. He had been unable to support himself during his last months, and relied on government handouts—an appeasement that was much ridiculed from the far left. 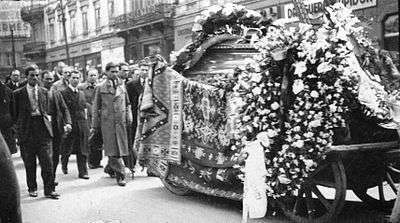 An independent Trotskyist newspaper, Proletarul, claimed that the Stelists had supervised Istrati's funeral ceremony, driving away his leftist friends. The Stelists were intensely courted by other far-right organizations, with which the Guard was competing for the nationalist vote. The Crusade was especially close to the National-Christian Defense League (LANC), from which the Guard had split almost a decade before, and envisaged the creation of a "united front" against democracy and "the radical left". In March 1935, a Crusade delegation attended a LANC's national congress. The state monitored such agreements, which also involved the Romanian Front, and reported that the Crusade was in the process of merging with the LANC. The LANC merger never took place. In September 1935, the Crusade of Romanianism sealed a pact with the right-wing "Georgist" Liberals and Grigore Forțu's extremist Citizens' Bloc of National Salvation. This three-pronged alliance aimed at involvement in national politics. The "Georgists" had also formed a cartel with the People's Party (PP), which had previously been one of the three most powerful parties in Romania. The "Georgist"-Populist alliance, or "Constitutional Front", came to include both the Stelists and the Citizen's Bloc. PP leader Alexandru Averescu was working to gather as much support as needed for prompting Carol to hand him power. His plan backfired: on one hand, the Stelists did not necessarily endorse the idea of a new Averescu government; on the other, the PP moderates protested against Averescu's cohabitation with fascist groups. By early 1936, the Constitutional Front still existed, but the PP had effectively withdrawn from it. Meanwhile, the Crusade was preparing to settle scores with the Iron Guard. Its newspapers published detailed reports about the contacts between Codreanu and King Carol, noting that the Guard enjoyed free publicity "in the official and semiofficial press", and even that government money was being spent on manufacturing Guardist insignia. More disturbingly for Codreanu, Stelescu was publishing information regarding secret contacts between the Guard and the royal mistress, Elena Lupescu, as well as statements implicating Codreanu in the Duca assassination and questioning his Romanian ethnicity. Stelescu already expected to be assassinated by the Codrenists, and repeatedly taunted his adversaries, instructing them to shoot him, but "not in the back". In July 1936, while recovering at the Brâncovenesc Hospital, where he had undergone an appendectomy, Stelescu fell victim to the Guard's revenge. A Decemviri death squad, comprising ten Theology students, had formally received Codreanu's blessing at the Iron Guard Congress in Târgu Mureș that April. Seizing its opportunity, it stormed into the hospital building and shot Stelescu to death. This murder left an enduring mark on public memory because of its ritualistic nature: Stelescu's body was not just riddled with bullets, but also bludgeoned or hacked to pieces. The orphaned movement still counted among its members some relevant figures in Romanian politics. Nicolae Rădescu, a Romanian Land Forces general, was an affiliate, and, according to some sources, became the Crusade's leader upon Stelescu's murder. He was in any case the decision-maker, and probably contributed to the movement's financing. Previously registered with Averescu's PP, Rădescu was a stated enemy of the political establishment. In 1933, upon presenting his resignation from the army, he had accused "profiteering politicians" and the king's "camarilla" of commercializing military life. Other Crusade members were harmed by Codrenist attacks, and, within the Iron Guard, "Stelism" became a crime punishable by death. Nevertheless, Codreanu feared retaliation, and surrounded himself with body guards. Cruciada Românismului newspaper was in print until 1937, by which time some of its members had embraced other causes. Moving on from the Crusade, Sergiu Lecca was involved in arranging contacts between the mainstream National Peasants' Party (PNȚ) and communist cells. Gheorghe Beza was also accepted into the PNȚ, and later left Romania altogether. At least one other Stelist had registered with the Social Democratic Party by 1946. Instead, Mircea Mateescu returned into the Iron Guard, celebrating its fight against "the deep, massive, darkness of the Romanian Sodom". In March 1937, the Gheorghe Tătărescu government clamped down on all paramilitary movements, banning political uniforms, including the Guard's green shirts and the Crusade's carmine shirts. The group dissolved itself, but Rădescu remained politically active into World War II, and was listed as one of King Carol's more potent enemies. He survived the "National Legionary" episode of Iron Guard rule, when he was reportedly marginalized as a "Freemason". According to one testimony, the general was never forgiven by the Guard for having supported Stelescu. During the putsch of January 1941, Iron Guard assassin squads were on the lookout for Rădescu, who went into hiding. Some former Crusade members were already working at undermining Romania's involvement with the Axis Powers. When, under the Ion Antonescu regime, Romanian troops occupied Transnistria, Rădescu issued a formal protest and spent a full year in the concentration camp. From his diplomatic post, Prince Karadja extended protection to Jews fleeing the Holocaust, coming into conflict with the SS. Meanwhile, Sergiu Lecca, who was the brother of Antonescu aide Radu Lecca, took part in informal negotiations between Romania and the Allied Powers. Although still an anticommunist, Rădescu was brought to high office by the Soviet occupation of Romania, and, from December 1944, served as Prime Minister. He refused to sanction Soviet abuse of power and clashed with the Romanian Communist Party, while pursuing war against Nazi Germany. Additionally, Rădescu was also at war with the Iron Guard puppet government that was set up behind enemy lines, but it is still debated whether or not he actually protected those Guardsmen who did not defect to the Germans. The toppling of Rădescu's cabinet in February 1945 was a new step toward the communization of Romania. Indicted as a crypto-fascist by the communist authorities, he escaped to New York City, where he helped form the Romanian National Committee. The surviving membership of the Crusade of Romanianism was also hunted down. According to aviator Ion Coșoveanu, who was for long a political prisoner of the Romanian communist republic, Stelists were a distinct faction among the anticommunist underground. Coșoveanu (quoted by writer Niculae Gheran) recalled that, once in prison, Crusade members used to bicker with Iron Guard rivals. Coșoveanu also notes that the Stelist faction accepted into its ranks the poet Radu Gyr, until discovering that he was informing on them for the Guardists. Talex himself was not touched by communist persecutions and was perceived by the authorities as a fellow traveler. When Istrati was posthumously rehabilitated in the 1970s, Talex worked on publishing his manuscripts and his correspondence. As argued by cultural historian Zigu Ornea, Talex's work in this field makes a point of obfuscating Istrati's contribution to the Crusade, as well as Talex's own. This contrasted with the treatment of other former Crusade people: Dem. Bassarabeanu's poetry was stricken from public memory by communist censorship, due to the author's fascist beliefs. Another poet, Mihu Dragomir, albeit formally aligned with communist ideology, was investigated for a supposed teenage involvement with the Crusade. Political historian Stanley G. Payne describes the Crusade as distinct among the Romanian fascist groups: "a tiny organization which sought to target workers and to inspire socioeconomic transformation." Within the party, there was always a degree of assimilation between fascist trappings and far-left causes, indicative of Stelescu's indecision. In his first-ever editorial column, Stelescu derided all political uniforms, and implicitly all political extremes, stating: "one can believe in something without donning a colored shirt, just as one can wear a colored shirt without believing in anything." He demanded a "united front" of "fearless warriors", entirely cut off from all preexisting ideologies. Nevertheless, Stelescu had personally selected green-colored shirts as the Iron Guard uniform, before his own movement settled on carmine. In March 1935 Eugène Ionesco, the left-leaning literary columnist, noted that Stelescu's newspaper made a habit of "confusing the extremes". Ionesco was referring to Cruciada Românismului's appreciation for the socialist poetry of Liviu Bratoloveanu. The appropriation of leftist ideas was especially apparent after the Crusade's involvement in the international Istrati scandal. When he first publicized his pact with Stelescu, Istrati specified an "absolute requirement that the Crusade keep itself equally distant from fascism, communism and the antisemitism of hooligans." In one of his letters, where he paraphrases the Stelist program, Istrati reaffirms this principle, while also noting: "Ours is a national movement for economic change, for civic education and for social combat. We are against capitalism, oppression and violence." The group was entirely against the parliamentary system, but harbored two distinct currents when it came to supplanting it. Stelescu himself wrote that "democracy sickens us", since it had resulted in inept governance "by a mass of nitwits". The movement viewed liberalism and human rights with suspicion rather than hostility, since they left the door open for "capitalism and politicking". Istrati had dissenting views. In its Christmas 1934 issue, Cruciada Românismului published his "Letter to... the Right", which called democracy "putrid" but described dictatorship as an unsound regime: "Dictatorship, of whatever kind, signals that the social organism has grown old. It is the system that will suppress in its adversary all his fighting means, to take them over for its own use, like an old man who ties up a robust youth and then proceeds to beat him up at his own convenience." Beyond its anticapitalism, the Crusade had as its main characteristic a strong connection with Italian fascism, as opposed to Nazism. Historian Francisco Veiga describes this as being a necessary repositioning against "Codreanu's Germanophilia"—when Nazi Germany and Italy where still competing with each other in Southeastern Europe. Other historians also stress the Crusade's anti-Nazism. F. L. Ford also writes that Stelescu's "dramatic forecasts" are notable protests against the Guard's Nazification. Armin Heinen paraphrases Stelescu's message: "he feared [Germany] would impose upon Romania the status of a colony." Also according to Heinen, Codreanu's celebration of Nazism as an international phenomenon had turned Stelescu's attention toward the Benito Mussolini alternative. As Talex recalls, Istrati was bothered by Stelescu's homages to Mussolini, and, on one occasion, threatened to withdraw from the common enterprise. His own political preferences were veering toward libertarian socialism and anarchism. Inspired by Gandhism, the "Letter to... the Right" advised against all forms of political violence. Istrati saw the Crusade as "rather a spiritual movement". According to Ornea, this was a naive assessment, and evidenced the degree to which Istrati was being "manipulated" by Talex. For Istrati's adversaries on the left, the Crusade involvement was proof that Istrati was a covert fascist. The allegations were publicized by two of Istrati's former colleagues in international communism, Henri Barbusse and Francis Jourdain. According to such sources, Istrati's "mercenary literature" and his contributions to a "fascist newspaper" earned him some 50,000₣, paid for by big oil. Overall, Trotskyist commentators were more lenient, writing off Istrati's inconsistencies as a sign of his perennial nervous instability. However, Istrati's connection with the Crusade was not his only contact with right-wing radicalism: he had also promised to have his political testament printed in Gringoire, a newspaper of the French far-right. Against Talex's disclaimers, several later exegetes have reanimated the debate about Istrati's possible fascist leanings. Historian Jean-Michel Palmier includes Istrati's name on a list of "intellectuals [who] saw for a moment in fascism the possibility of arousing a crisis-struck Europe from its lethargy." He is in the company of Knut Hamsun, Ezra Pound and Wyndham Lewis. Philologist Tudorel Urian asks: "Who really is Istrati: the frantic socialist he was before his visit to the USSR [...] or the nationalist of his very last months, the emblem of a Guardist periodical? There is something that those who judge him rarely take into account: in the periods when he flirted with socialism [...] and Guardism, both movements where in their romantic, idealistic stages. Once he came face to face with the brutal realities of the Soviet regime, Istrati broke with socialism and perhaps his famous motto, je ne marche pas ['no, I won't bite'] would have come into play in relation with the Guardists, should he have lived to see their earliest crimes." According to literary historian Angelo Mitchievici, "Interestingly, [the Crusade] had stated its dissidence and a distinct position within the Iron Guard movement. Perhaps it was the group's marginal, dissident status that appealed to Istrati. [...] Even if, in this very context, Panait Istrati endures as a freelancer, he could not have evaded the abusive assimilation into a direction that did not truly reflect his affinities." The Istrati scandal touches another controversial aspect of Stelist policies: their Iron Guard-inherited antisemitism. Stelescu sent the message in November 1934, when he criticized ethnic minorities for monopolizing the job market: "Factory positions for Romanian workers, our own kind first and if anything is left we would gladly share it with the foreigner, if he is indeed in need of." According to Veiga, Istrati "toned down the antisemitism of Stelescu and his followers, but the [Stelist] Movement continued to be a far-right one." Also, "the disillusionment he felt toward Soviet communism did not manage to make Istrati into a fascist; quite the contrary, he was the one to influence Stelescu, making him renounce, for instance, his antisemitism." Among the Crusade men, Prince Karadja witnessed first-hand the application of antisemitic terror in 1930s Germany, and was already taking measures to protect the Jewish Romanian expatriates. In his papers of 1935, Istrati presents himself exclusively as an enemy of "the Jewish bourgeoisie", a class he describes as "corrupt, pseudo-humanitarian, pseudo-democratic" and accuses of stirring up scandal. Istrati's articles in Cruciada Românismului are more adamantly philosemitic. One of them, "A Letter to Love", led to a series of articles on the subject, from Stelescu and other Crusade people. In his own articles, Talex answered for the Stelist movement: "Panait Istrati, do you know what it is we need? A fist... The Crusade of Romanianism will attempt to become that fist... Our antisemitism? Just the same as yours: a humane one. But it is also combative, for as long as the Judaic element shall attempt to set up a state within our own state, sabotaging us with any opportunity it gets". Stelescu's newspaper was noted for its obstinate claim that Jews were a rootless, disloyal race. The Crusade's agenda was debated among Jewish Romanian intellectuals. Fellow writer Mihail Sebastian described Istrati as politically "illiterate" and "addled". In his words, "Mr. Istrati fights nowadays for the Crusade of Romanianism, searching for the formula of reasonable antisemitism (neither here nor there), for the way into a more gentle chauvinism, for a nice agreement between his anarchic vocation and a methodical process of bashing heads in." Other Jewish literary figures, including Josué Jéhouda, issued statements in support of Istrati's stance. The Crusade may have contextualized its antisemitic reflexes within a pro-Christian bias. The American Jewish Committee papers describe the Crusade as "a Fascist group which did not have anti-Jewish tendencies", quoting Stelescu's statement "that he was not a Jew-baiter and that, although his party was nationalist, it was inspired by genuine Christian principles." The movement resented the secularization of public affairs, and expressed admiration for Romanian Orthodoxy: "And if some church servants have indeed trespassed, faith itself is not to blame. The belief in God and The Cross is a banner and support for our combat, and the token of our coming victory." However, according to at least one account, the ailing Istrati was in the process of becoming a militant Roman Catholic. The Crusade believed that its mission included protecting Christian interests against the consequences of modernity. It was critical of feminism, noting that Christianity itself had liberated women, had given them status and purpose. However, it also asserted that woman was "the guardian angel, always in the shadow of man." Feminism, meanwhile, was "equality in vice." The Stelists also accused the Soviet Union and its Romanian sympathizers (for instance the staff of Cuvântul Liber newspaper) of mounting an international campaign against Christianity. When Stelescu founded his "White Eagles", the right-wing nativists, the centrists and the advocates of left-wing nationalism in Romania had been disputing over the concept of "Romanianism" for over a decade. The idea of a homegrown ideological current of that name was swiftly embraced by intellectual sympathizers of the Iron Guard, among them Nae Ionescu, Nichifor Crainic, Alexandru Randa, Traian Brăileanu and Mihail Manoilescu. An alternative Romanianism, liberal and skeptical toward nationalist rhetoric, was being promoted by the philosophers Constantin Rădulescu-Motru and Mircea Eliade, who demanded the continuous Westernization of Romanian society. Before he was won over by fascism, Eliade defined Romanianism as "neither fascism nor chauvinism—rather, the mere desire to realize an organic, unitary, ethnic, balanced state". The Crusade's version of the concept borrowed from all sides of the debate. In his "democracy sickens us" essay, Stelescu proposed: "Romanianism is the only credo that might invigorate this nation. Solutions for its sons, from its bosom, within its spirit, on its soil". According to Talex, this brand of Romanianism was "noble and creative", Istrati being its leading exponent. When first introduced to Gandhism and the Ramakrishna Mission in 1930, Istrati himself had declared: "To me, the Occident is dead." In 1934, Stelescu's newspaper noted with satisfaction that nationalism was even making its comeback in the Soviet Union. Reading the Soviet press, the Stelists remarked that references to the Comintern and the cause of proletarian internationalism were being discarded, and that Mother Russia was returning in force. Talex, who described himself as a "know-nothing" in political matters, had for a personal idol the nationalist historian Vasile Pârvan. He was especially inspired by Pârvan's Russophobia, which colored his reading of Istrati's work. His admiration for "Romanianism" pitted him against the more cosmopolitan liberals of the day, prompting the Crusade's journalistic attacks against Eugen Lovinescu, the doyen of Romanian liberalism. Lovinescu (who had been Talex's high school teacher) was called "a con artist" in Cruciada Românismului.